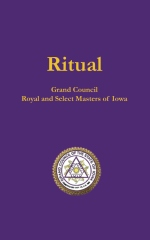 The Grand Council Royal and Select Masters of Iowa is proud to offer the Iowa rituals for the Royal Master and Select Master in two different ways to help Companions study and learn the work. Order a 5″x8″ soft bound copy for $5.00 each plus shipping and handling. Get the ritual electronically in PDF or ePub format.